4 Stars from Night Owl Reviews: Confusedagony wrote: "I actually read book two in the Cherokee Valley series first. I had no idea it was a sequel until I got to chapter two, so when I saw Distant Obsession up, I wanted to check it out. 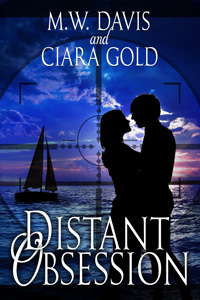 Distant Obsession is a really good thriller romance. This book had me guessing until the very end. Regarding the characters, I love how protective Lilah is to Ashley even though she’s a grown woman; she will always be her little sister. I loved how Ashley flirted a little with Reese in order for him to come over and meet Lilah. Ashley is definitely a free spirit. When things start to happen around Lilah, I knew for sure that the hit man was around, and maybe wanted to finish the job he started. I think Reese is a good fit for Lilah, and he’ll help her live life to the fullest and break down those very high walls she has built up. Lilah, aka Carmen, is so different from her sister Ashley. She’s more settled, cautious, shy, and she paints and enjoys the silence. Lilah is in hiding not just from the paparazzi, but from everyone. It’s been crazy and gets even crazier when she finds out her husband’s death was by a hit man. Her quiet life gets turned upside down when Reese gets the courage to go up to her place and introduce himself to her."